It is one thing to study war and another thing to live the warrior’s life. —Telamon of Arcadia, mercenary of the fifth century B.C.E., as quoted in The War of Art, p. 61. Study is a good and necessary stepping stone to life. Telamon, no doubt, had to “study” to sharpen his battle skills with sword and spear. But at some point, he had to “enlist”—he would have to do the necessary strategic planning to lead his army and put his studies to the test. 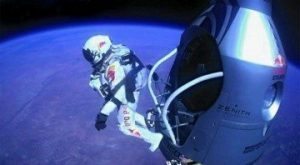 Austrian adventurer Felix Baumgartner is a modern example of someone who did the essential strategic planning to jump into the warrior’s life. On Oct. 14, 2012, Baumgartner (a.k.a Fearless Felix) set several world records as he stepped out of a capsule that had ascended to 128,100 feet, suspended by helium balloons. What we miss is that Baumgartner did the heavy lifting of strategic planning in order to set this record. That careful plan was five years in the execution! Baumgartner understood clearly that there would have to be a master framework within which thousands of decisions could be made in order for him to stay alive to achieve this record. Together with a team of high-speed flight experts, Baumgartner executed his strategic plan over five years. For example, the David Clark Company modified a high-altitude pressurized suit to protect his body as he crossed the 62,000’ Armstrong line. Baumgartner trained to overcome the claustrophobia of being in a pressure suit head to toe for up to five hours. A former BASE jumper and helicopter pilot, he learned to maneuver his suit while hurtling at supersonic speeds. Most importantly, he learned via training to distinguish between what he had no control over— mechanical operations—and what he could control—his physical, mental and spiritual preparation as well as what actions he would choose once his capsule achieved proper altitude. Exiting his capsule was but the culmination of his strategic planning. Baumgartner jumped from 128,100 feet, setting a record for longest free fall (119,846 feet). He encountered spinning problems: during a 40 second spin, he was able to regain stability, staving off the potential dangers that they had anticipated. He set an unaided speed record: 833.9 mph/Mach 1.24. He set his records exactly 65 years after Chuck Yeager first broke the sound barrier in an experimental rocket-powered airplane. He didn’t black out from lack of oxygen. His skin didn’t boil; the suit held up! Baumgartner didn’t experience excessive G-forces that could have torn his body apart. Baumgartner is an example of one who did the strategic planning to live to tell of his exploit. What “astronomical” challenge might you might be facing in 2016? How might taking the time to do strategic planning this month enable you to be alive to relish your achievements on January 1, 2017? In the spirit of Thanks-giving, reach out to your best clients in 2015 and thank them. Make plans to land “bigger clients” than you think you can handle. Or choose to keep playing “small” to avoid risks! Schedule time with your executive team to work ON rather than IN your business. Have your team ask “Which one of these profiles characterize our business today?” Make a fearless inventory of where your business is. Then, take your team through a strategic planning process. Check out ABA’s Systems of Services to get some ideas of what to cover in that meeting or, click here and we’ll be glad meet with your team to run our complimentary assessment for you.